Travel broadens the mind… at least, creatively. 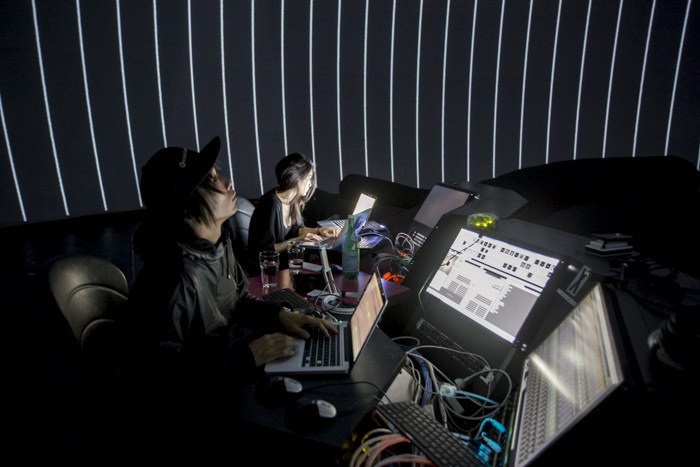 Paris-based Franco-Japanese duo, Nonotak, comprising artist/illustrator Noemie Schipfer and architect/musician Takami Nakamoto, is stopping by Montreal’s Society for Arts and Technology for a weeklong intensive artistic residence that allows them to develop immersive, site-specific audiovisual project, VERSUS. 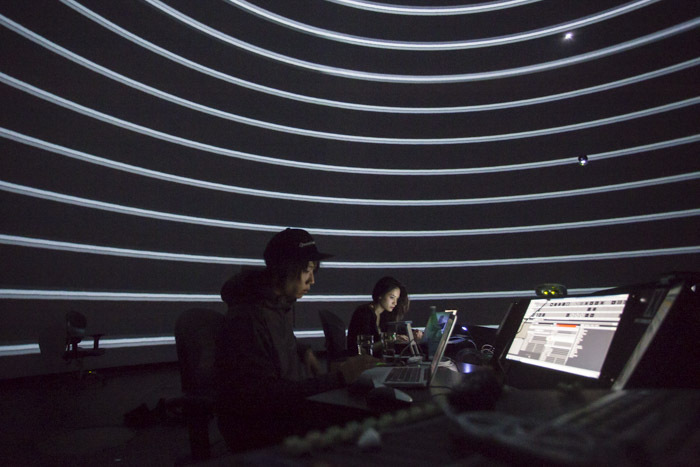 Taking advantage of the SAT dome’s technical features, the duo’s latest creation fills the Satosphere with VERSUS‘ public presentation, starting next Tuesday. 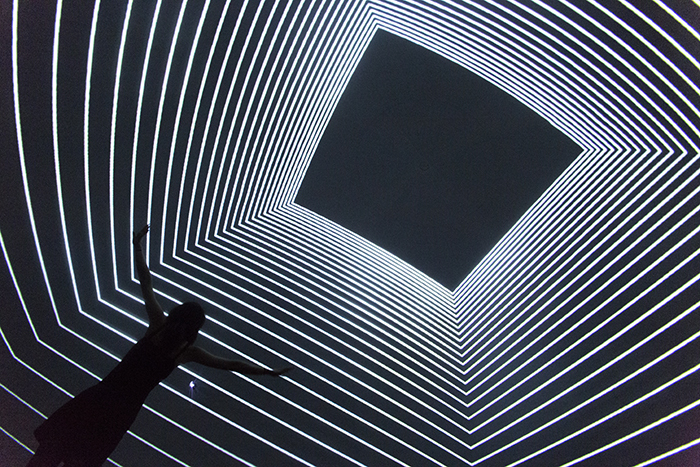 The installation uses an impressive combination of cutting-edge visual tools and sound spatialization techniques to fill the 360-degree canvas with their black-and-white geometric aesthetic, and to open up new perspectives by unifying space, sound, and visual specificities that overwhelm physical perception. Yesterday evening, we made it under the dome and spoke to the Nonotak duo for an exclusive insight into VERSUS. 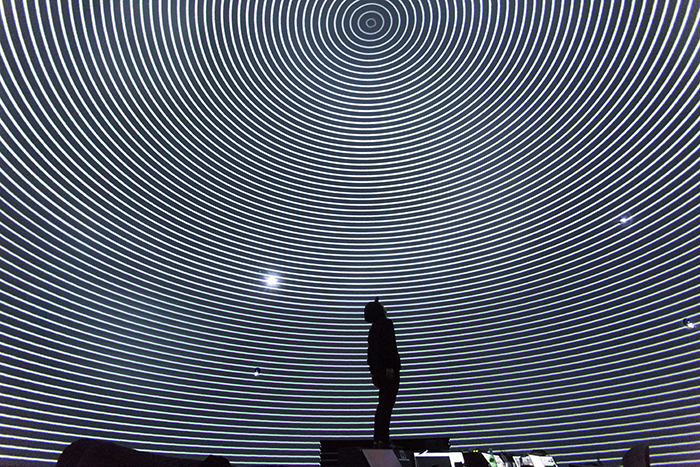 The Creators Project: You’ve been in residence at the SAT for a few days now. Can you briefly describe your workflow? Nonotak: Yes, we’re here for 8 days to create a/v content. First and foremost, we find the place impressive. We had come here as viewers but discovering the Satosphere’s control room to integrate content is very exciting. Very exciting, but also a lot of pressure knowing that we only have a week to put a show together. We’re used to create the sound design at the same time as the visuals, so we didn’t change that, but the complexity of the SAT’s sound system, which is made of 32 individual channels, brings us naturally to go get sound material and use it as inspiration for the visuals. It’s been awhile that we’ve been dreaming of composing for such a system. At mid-residence you probably have an idea of what the audience can expect with VERSUS. Can you give us a few details about the content? We’re still right in the middle of the creative process, but the audience can be sure it’ll be in front of aesthetics true to Nonotak. We know that the dome’s setup can easily bring us to slightly get away from our usual work but we plan on forcing ourselves to stay simple, to work with the projections as light matter. However, what could change is the narrative rhythm. Here, the audience lies down on comfortable cushions, which makes [things] easier, and mostly make possible a longer and more progressive reading of the piece. That influences our way of composing the narrative and obviously opens up more room for sound to settle in the space. Did you have any inspirations for the genesis of this project? From the beginning we were obsessed with the idea of creating immersive works, no matter their scale. We like to think that beyond the work or installation that’s created, there’s an environment/atmosphere that comes with it, that the audience will feel when they’ll encounter our work. We’re used to coming and ’unfolding’ our work in a certain space, as if we wanted more than anything to avoid the flatness of screens. With the Satosphere, we find ourselves in a particular relation, in which the dome is a base, a screen, but also a physical space in which we can wander. This relation immediately struck us when we went inside the dome for the first time, but what really inspired us basically, is the ability to lay down to appreciate a piece! Can you talk a bit about VERSUS’ creative process and specifically the tools you’re using? The creative process is pretty different here. It’s in fact the first time that we get on-site and that the stage management system is already ready to roll with a technical team that knows that Satosphere inside out. The sound system is pretty unique since it has 32 channels, which makes the sound aspect important but also makes a complete sound spatialization possible. We use Ableton and Max to both send the sound where we want it in the space but also to visualize it. We use a Max super patch put together by Olivier Rhéaume of the SAT to spatialize sound textures in addition to all the individual routings made with Ableton. 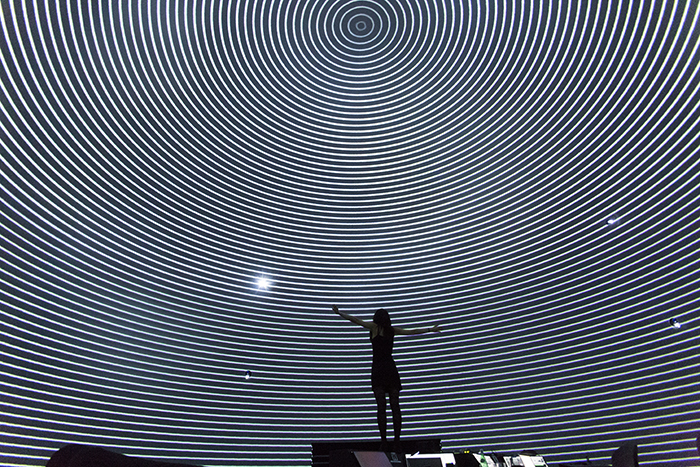 Data MIDI controls are then sent in a Resolume session that sends the visuals to 8 projectors. Can you give us more details about the immersive dimension in VERSUS? We’re exhausted—it’s 2:39 AM Benoittttttt. How will you be pursuing VERSUS? And what’s next for you? This project is so specific to the space, to this setup that it’s hard to imagine a project along the same lines, but in a different context. For example we’ve already been asked if there would be a ‘flatscreen’ version of VERSUS later on, and we really hope that VERSUS will be impossible to adapt on a screen, because of the degree with which we’ll take into account the Satosphere’s space and context. It’s also for this reason that it was essential that we do an artist residency here in Montreal, to compose on-site. However, it’ll maybe give us other ideas for dome projects. After this residency, we’re leaving for SIGNAL in Prague, for a new project called CONVERGENCE, then to Mutek Mexico to play REFLECTIONS and a new project called MONO(LITH). See more of Nonotak Studio’s work on their website. Click here to learn more about the show.